Long time, no write, now for some news! Well it's been a while, and I have news! We are expecting again! The baby is due at the begining of summer and we are definitely excited although I could do without the morning sickness. I haven't been writing lately due to all the mornig sickness and general exhaustion that my pregnancy has brought me, today however I'm feeling pretty good. In other news I now have a tablet which allows me to be a little more spontaneous in blog postings and photo ops. I'll also be able to blog while I'm out and about which is good because that is about the only time that Buzz seems to nap these days. 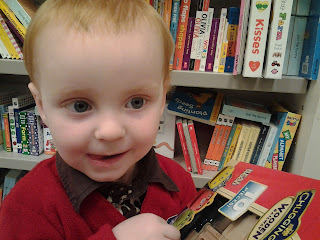 Right now however Buzz is awake so it is time to read, play, and do a little Christmas shopping.